Let’s face it sometimes it’s the little tasks that can cause the largest headache because, well, they are little; they shouldn’t be so difficult! Like the whole school supply list thing! 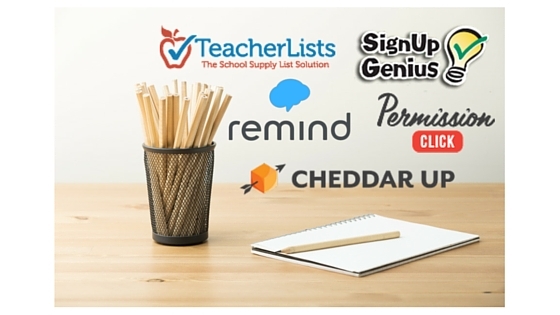 Along with TeacherLists.com (which we all know and love) we’ve created a quick roundup of a few other basic technologies that can make those little tasks easier and help #SchoolsWorkSmarter every day! Getting Supplies – Back to school is crazy town for so many reasons. You know what the classroom and students need. Let’s not make it difficult getting those supplies to school and on time. Enter TeacherLists.com. Have us add your school supply list, email it to parents, post it on the school or classroom website and call it a day! Each list is now linked directly to supply retailers like Target and Amazon which makes shopping easier than ever for parents. Why not add a wish list too because we all need extra glue, paper towels and tissues throughout the year! You’ll thank the parents for their contribution. They’ll thank you for making it so easy. Recruiting Volunteers – It sounds so easy and there are lots of parents who want to help – right? Sometimes the details and coordination can take a lot more time than you anticipated. You just need 3 parents to come in for the Winter Festival, 2 parents to create flashcards, 1 to take class photos for the yearbook, 4 to join the students on trip to the science museum and 1 to make red flags and 3 to make blue flags for the school spirit parade. That in an email is daunting. SignUp Genius has you covered. Their sign up list tool is incredibly easy to use and you can specify what you need, when you need it and can even add photos or links to help with the planning. Best part – it sends reminders to those who have signed up so that on top of everything else, you aren’t emailing and calling everyone at 10 o’clock the night before the activity. Collecting Money – Never mix money and school parents. “Um, Cindy’s mom. Yeah, Hi. This is Tom’s teacher. You owe us $10 for that field trip still….” So Awkward! Let CheddarUp be your middle man. You can set up a custom page for collections in a matter of minutes. Then they track whose paid (online and offline) and send out auto reminders so you can avoid that awkward interaction after school or over the phone. Teachers do not read this next part. Parents who are collecting money for those fabulous end of the year teacher gifts? This is perfect!! Getting Permission – Planning to take the students to that ultra cool new science exhibit but first you need permission and $10 from the parents of every 4th grader in town? Wouldn’t it be nice if you could just sit down at your computer, quickly create a permission slip, have the powers that be at each school approve it, email it to the parents and track comments and payments online. Yes! That is PermissionClick.com. And next year? No worries. You’ll have all your slips archived so that you don’t need to reinvent the wheel. Passing Notes Outside of Class – You won’t get in trouble for this one – you’ll get thanked. You know how sometimes the weather messes up your plans for a class hike on Friday or you have a photo of the kids watching the classroom chicks hatch you want to share or you need to get 3 parents together to chat about plans for an upcoming event or you really need to let a parent to know that you are just running 2 minutes late for their conference? Well the Remind App lets teachers communicate via shorts texts with their students, parents and colleagues. You can attach photos, initiate a chat with a group, schedule reminders and even record a voice note from the class telling John that they miss him and hope he feels better soon. The phone numbers are kept private and messages can be delivered as a text, announcement, email or smart phone notification. All in all a great way to augment your offline relationships and keep the students and parents engaged! And that is that. Now you’ll have time to focus on the larger things. Like teaching the kids! If you like these ideas be sure to share with the teachers and administrators you work with so that the whole school can take advantage!